Updated 1/11/2016 And this sketch fulfills one of those silent wishes that a collector knows will never come true and yet wishes anyway and then one day . . . somehow . 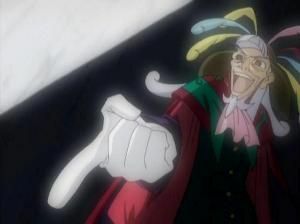 . .
After an A3 key (a partial, not imaged), Drosselmeyer turns from his cynical view of his duplicated study and points an accusing finger at Fakir. His hand “sticks through the screen” with impressive foreshortening as he comments sarcastically: how can you try to write like me when you spend your time acting like a pale imitation! A lovely, finished drawing with hardly a sign of revision or hesitation, with careful attention to his complex “nutcracker” costume and face, this one is as fine an image of this character as I can ever hope to own. Thank you, genga no kami!